Just the thing for despondent, suicidal Democrats after their Messiah loses in November. Keepsake sized Personal Cremation Urns are the latest in custom personalized cremation urns. They are created from one or two photographs with exceptional attention to details. With advances in facial analysis and the advent of state of the art 3D imaging, these high tech urns can be made to look like anyone. The personal urn does not come with hair. 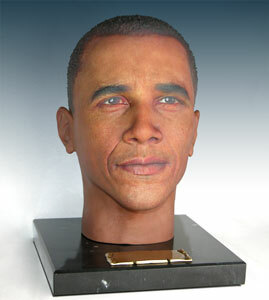 For hair we can digitally add hair if you wish, as you can see with our sample of president Obama. For people with longer hair we can add a wig from your specifications. This cremation urn comes on an elegant solid marble base. A Plaque and nameplate are also available. Personal cremation urns can be designed to look like anyone. We just need good pictures. We prefer one picture from the front and one from the side. Complexions can be adjusted in the final stages and customers get a chance to proof the results. I'll make an urn for the ashes of America. Cremation urns helps keeping the reminiscences of a person who left for heavenly abode, because the friends and relatives will like to keep their loved one in the memories forever.